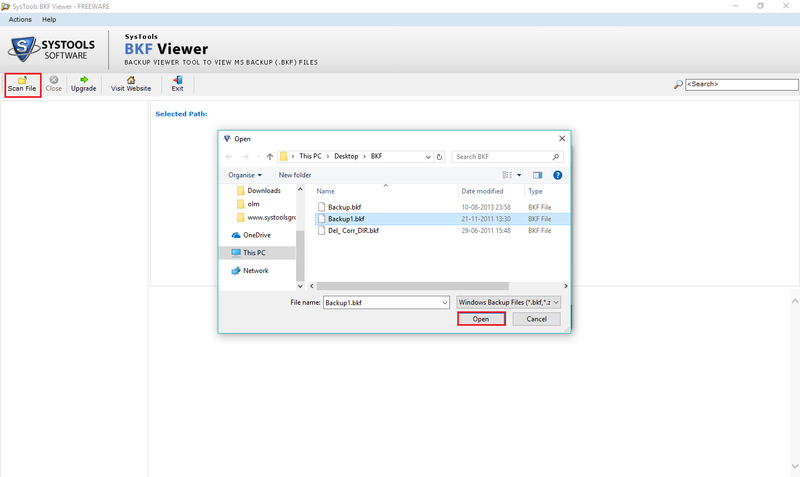 The Windows BKF file viewer enables users to view all files and folders from the backup file. If an individual is encountering any trouble in accessing BKF file in Windows 10, 8, 7 then, this free utility is there to help. 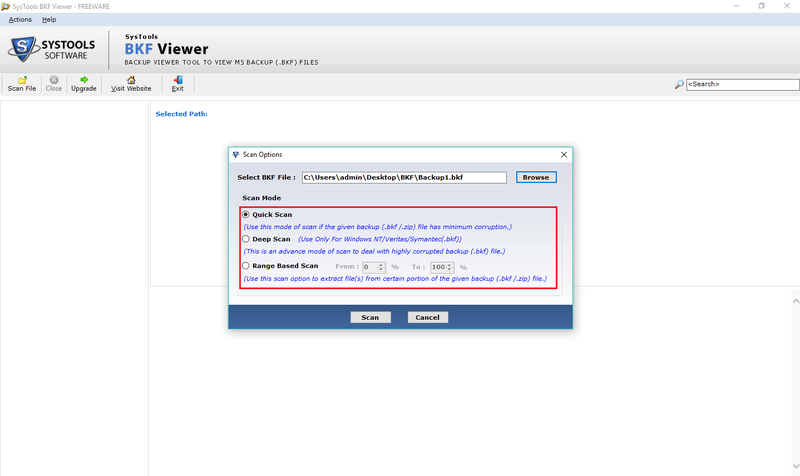 Without wasting a single minute, the software loads the encountered data on the preview panel. Users will be able to view each and every items with their respective name, size (in KB), and modification date & time. The BKF file explorer loads all the archived files on its preview screen in their original format. 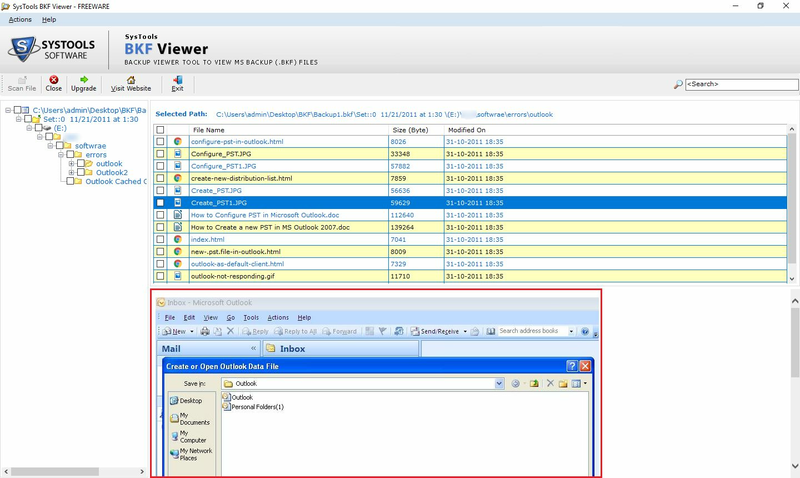 A searching tool bar is provided in the free BKF file viewer. This will help user to read only the wanted files and avoid the unwanted items. One needs to mention the file type or extension or any related phrase of the file, which they want to view. Software automatically enlists all matching items on the viewing panel. The BKF file opener renders a very simple and self-explanatory layout to its customers that no difficulty will be faced by individuals while working with it. No technical guidance or expertise knowledge is required to work it. Not even a single supportive program is required while working with this explorer. Since backup files are originated on MS Windows XP therefore, users face difficulty while opening or restoring BKF file on Windows 10, 8.1, 8, or 7. 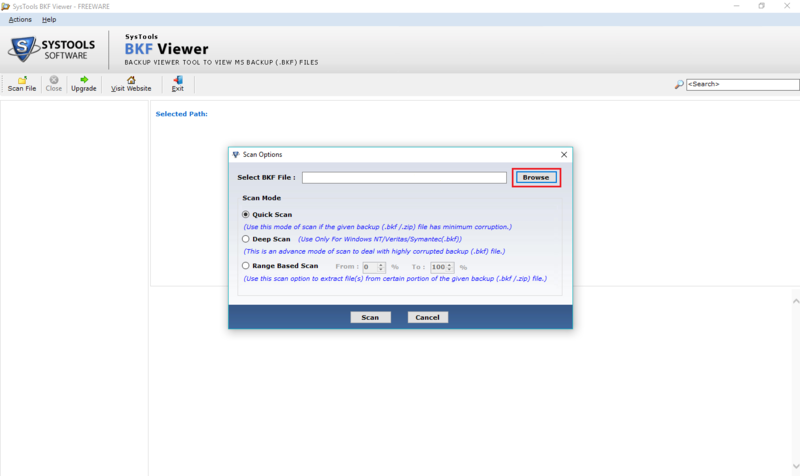 In such condition, one can use this free BKF viewer for opening .bkf file without any dependency issue. The tool easily works with healthy as well as corrupt BKF files. Trial version of software to view & open bkf file in Windows. Free version doesn't save the data. Is your freeware compatible with MS Windows 8.1 operating system? Yes, our free utility is a Windows-based application, which is supported by all versions of Windows OS. This can include Win 10, 8.1, 8, 7, and all the prior versions. Will the BKF file viewer work with corrupted .bkf file? Yes, the free tool is capable of working with corrupted or damaged BKF file. It thoroughly scans corruption from the file and extracts entire file data from it. I am working with a BKF file of 1TB. Will your free application work with this size of Windows backup file? Yes, no matter what is the overall size of BKF file, our free tool works with any size without any hassle. Does your software provides any feature of saving extracted file on local machine? Well, for this you need to upgrade the free BKF file reader to its pro version. This will render 2 different data extraction mode, which users can use to save regained data from BKF file. I had an old Mac OS X virtual disk image that was recovered during a system crash. It contained important company data that needed to be saved on a Windows PC. We used the DMG Viewer to access all our crucial data. It helped the complete IT team and prevented any legal action from taking place against the company. I am quite impressed with the dual scanning mode feature of BKF file opener. Seeing its name and highlighted features, the software seems to be a solution to only open backup files. But, in real, the things are more useful and versatile, enabling users to explore corrupted BKF files too.